It has been a great year working with you! Have a happy holiday season and a successful new year. Please note that our company will be closed on the following dates: 24th, 25th, 26th, 31st of December and 1st of January! DP 1050 is the most compact impact wrench in Paoli’s Automotive range. Maneuvrable and light, it is 92 mm (3.62 inches) long and weighs 1,3 Kg (2.87 lbs). We interviewed Fabio, a motor vehicles and Motorsport mechanic with a ten-year-long experience in several famous racing teams. He told us how important it is to have a pocket impact wrench at disposal: “DP 1050 is an useful tool, because it allows us to easily work in situations where we have little space available”. DP 1050 has a ½” square drive and a M10-M16 bolt range. The strong Jumbo hammer mechanism, 9000 RPM free speed and 700 Nm (518 ft-lbs) ultimate torque make DP 1050 a reliable and powerful impact wrench. DP 1050 is the ideal solution for car repairers and workshops that are looking for an ultra compact impact wrench with high performances, without losing quality. Paoli’s power and reliability, in just 92 mm. Paoli’s compact impact wrenches range, specifically created for workshops, comes from the company experience in the Automotive field. This products have been designed to offer to the operator comfort and easy use, to be as convenient as possible and to provide great performances. 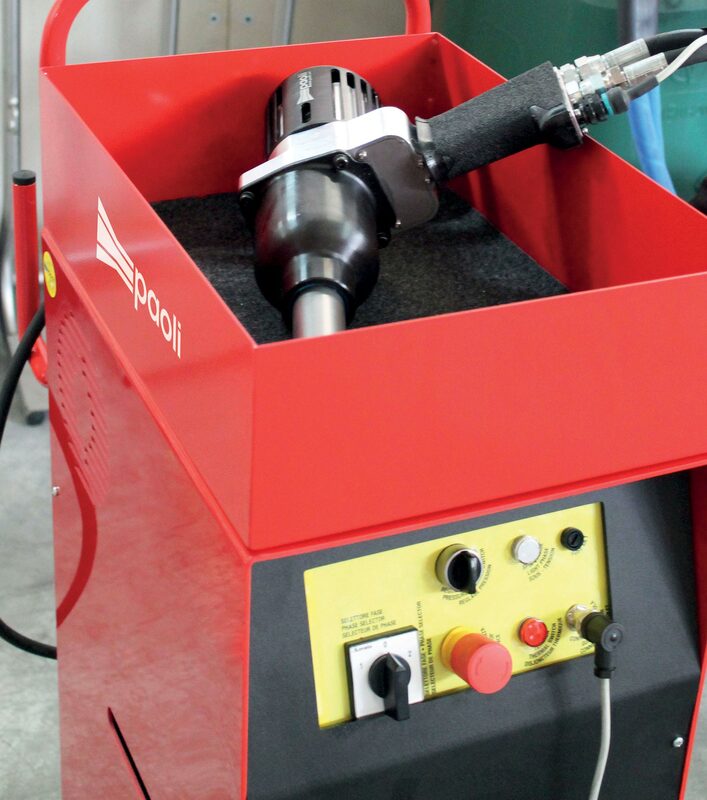 DP 1800 is the ideal solution for tire centers and small mechanic’s workshops. Small size and little weight, just 2.1 Kg (4.63 lbs), allow this impact wrench to easily perform each task. The 1,080 Nm ultimate torque, built-in power regulator and twin hammer mechanism make DP 1800 a suitable tool for professional employ. DP 1800, available in short anvil or long anvil versions, has a M10-M16 bolt range and a ½” square drive. DP 3400 is recommended for industrial assembly, heavy vehicles and commercial vehicles. The optimized weight/power ratio permit DP 3400 to always achieve the best effectiveness during the usage. The 5,500 rpm free speed, 1,690 Nm ultimate torque and twin hammer mechanism ensure a great performance in every situation. Strong and reliable, DP 3400 has a M32 bolt range and a ¾” square drive. Available in short anvil or long anvil versions, it is equipped with a 3-levels-indicator trigger. The small dimensions, ergonomics designed to optimize the handle and high-durability materials make DP 1800 and DP 3400 perfect tools for the most demanding professionals. Paoli’s Formula1 experience produced DP 246 and DP 251, able to supply to the users the best available technology, developed through the collaboration with the best racing teams. Made for heavy vehicles application, they have both a 1″ square drive and a bolt range of M18-M39. DP 246 is the most requested professional impact wrench with a 1″ square drive. Light and strong, is provided with a new Pin-Clutch hammer mechanism made by aeronautical aluminium, with oil bath lubrication system. Characterized by an Ergal front cover and a low vibration level, it is the perfect tool for trucks, buses and for industrial assembly. It is available also in medium and long anvil version, it has a maximum torque of 2796 Nm and weighs 18.2 lb (8,24 kg). The new model DP 251 has been designed to increase the weight/power ratio. The maximum torque of 3038 Nm and the improved 3-jaw hammer mechanism make the impact wrench a powerful, extremely precise and reliable tool. Characterized by black anodized aluminium body and with grease hammer mechanism lubrication, it weighs 20,06 lb (9,10 kg). The DP 251 is also available in long anvil and in ATEX version, specifically for mines, oil fields and shipyards. DP 246 and DP 251: quality and technology with no compromises. The proper design of a workstation and its adjustment to the operators’ necessities are strictly connected with the performance and timing improvement and with the workers’ well-being. For this reason Paoli, always careful of the technicians’ needs, has created and realized the Ecological Trolleys: mobile workstations that ensure a comfortable and ergonomic seat. The operator, using the built-in suspension system in the arm, doesn’t need to hold up the wrench during the entire work session. The Trolleys have wheels, in order to allow an easy transportation. The importance of the working environment health safeguard guided Paoli’s engineers to design new systems that protect the operators’ well-being. The exhaust air of the impact wrench, which is conveyed into a silencer mounted on the trolley, was created in order to allow a considerable reduction of the acoustic pollution and to ensure the total absence of harmful powders. The Ecological Trolleys are available in two versions: the New Suspension and the smaller and lighter Slim Suspension. Take care of your health with New Suspension and Slim Suspension. the event which will allow friends and fans of motorsport, to be protagonists of a true PIT STOP experience, using professional Paoli wheel guns. The same as the Formula 1! Thanks to the partnership with MTS School – Motorsport Technical School and Team Racing Studios, teams composed by “aspiring mechanics”, will compete, stopwatch in hand, for the fastest pit stop. Excitement, adrenaline and fun, as only on a track, you can feel, will be guaranteed! Winners will be rewarded with gadgets and professional Paoli tools. On Friday 22, NASCAR driver Alex Pignone, will join us for the day and an exclusive interview. Him, together with GDL Racing Team, will bring Red Devil Wheel Guns-by Paoli- all around Europe and to the legendary Daytona for 2015 U.S. Nascar Championship. – Friday 05/22 from 02.00 p.m. to 05.00 p.m.
Let’s the challenge begin, see you in the Paoli Pit Lane! The 2014 SEMA Show will be held November 4–November 7 2014. The 21st “Win Automation” was held in Turkey between March 19th and 22nd 2014, with businesses from 23 nations attending, including Italy with Dino Paoli Srl. Paoli grabbed the opportunity to present its Automotive and Motorsport products and show off the Italian technology and quality at Eurasia that is the hallmark of Paoli products. A new market bursting with business opportunities, a new direction that the Paoli Team has decided to monitor constantly by focusing part of its work on it. The successful partnership continues between Dino Paoli and the Motorsport Technical School in Monza, the first and only Italian higher training school in the competition mechanics field, managed by ex-driver and team manager Eugenia Capanna. “We are leaders in the production of impact wrenches,” states Francesca Paoli, CEO of Dino Paoli, “and since the 1990s we have been supplying our products to the highly demanding Formula 1 sector, where speed and reliability are fundamental requirements for safe, high quality tyre changing. We are happy to work with MTS and for this reason we continue to make available all our know how to train specialist technicians with in-depth knowledge of our products. On 28 February and 1 March next, we will be at the school for another pit stop lesson”. The first meeting organised by SiciliAutomotive was held at the “Valle dei Margì” country resort at Grammichele (CT) on Sunday 29th September. The lovely Sicilian countryside provided an ideal backdrop for the various Automotive companies presenting their principal products, including Paoli with its display of professional and electric impact wrenches. A day marked by discussions, debates and exchanges of opinion, where the common denominator was technology, innovation and competition, all Made strictly in Italy.